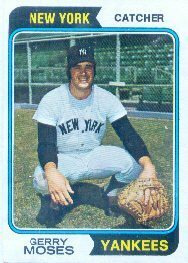 Jerry Moses served nearly a decade in the majors. Time stands still for Boston fans, who’ll forever remember him as the baby-faced catcher made of steel. Moses saw limitless potential in one teammate: Tony Conigliaro. I thought Moses would remember a highlight of his Fenway days as the homer from April 20, 1969 off Steve Hargan. Did he watch it clear? I dared to ask: if that wasn’t your favorite homer ever, what was? That wasn’t the only surprise in the letter from Moses. “I should have had a better career. I worked hard, played hard and did was I needed to do. I listened too much to some coaches who tried to change my way of hitting. I never had a problem hitting and was a home run hitter. By using the coach, I became a line drive hitter. Moses reveals much more in this fine Red Sox blog feature interview (at least the Boston parts), “At Home At Fenway”! This is a great encyclopedia of Twins AUTOGRAPHS, too. I'm hoping to learn more from Blake about Twins sig collectors in the future. Meanwhile, enjoy his super site!! !